CORTADORA SIN ESCOBILLAS DE 20" Y 40 V está calificado 4.7 de 5 por 2787. Calificado 5 de 5 por BobD de Impressive Just moved and opted for Ryobi 18v system for inside work and 40V for outside. 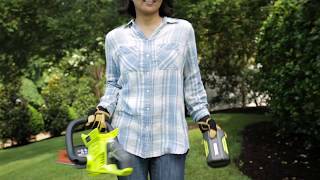 Purchased trimmer extend system, pruner, chainsaw and lastly this mower. Grass was 4" long and damp on my first cut but this mower went through it no problem. You could hear the revs changing with the thicker grass but not an issue. Used the mulcher which worked very well on both the grass and the leaves of our many trees.Used 2 batteries for the cut of a 100 x 150 foot property which I thought was reasonable. Very pleased with my purchase decision as I don;t like playing with 2 stroke equipment. Would recommend Ryobi tools to anyone looking for a quality product. Calificado 5 de 5 por Anonymous de Better than expected! My front yard and back yard are at separate elevations and require me to carry the mower up and down 2 flights of stairs. I bought this mower over the summer to replace my 100 lb gas powered mower because it weighs less than half as much as the gas mower. An added bonus is that the handle folds down easily and I can carry it at any angle because there are no fluids to spill or carburetor to flood. I was pleasantly surprised that not only was the mower easier to move between levels, the mower is super quiet (no need for hearing protection), has plenty of power (ramps up motor automatically when needed), is easy to push, folds up for compact storage, and has a long run time on a full charge. 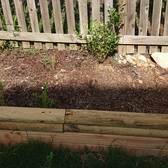 Calificado 2 de 5 por Roosta de Very Disappointed Let me start off by saying I have the 40V string trimmer and bought the chain saw extension piece. I really wanted this mower to work. I borrowed a coworkers Ryobi 40V mower just to verify the power vs. my plug in Black N Decker. It worked great, which is the reason 2 stars vs 1. I bought my own, charged the battery, and mowed the lawn. It died 7 times over the course of a 30 minute mow. I typically would have returned it and bought the Ego without giving it a second thought. I wanted the Ryobi to work so bad I returned it and got another one. This one died 8 times over a 30 minute mow. Judging from the fact this happened to me twice, I’m sure Ryobi has a problem… now let’s see how they handle it. Calificado 5 de 5 por Galrifai de Eco friendly and great product After 6 years with a landscaper,I finally decided to go green and purchased the Ryobi 40 V 20 in brushless mower.I was amazed with ease of assembly,quiet motor, and sipmle use.I had a perfect cut for my Zoysa lawn,and easily stowed it in my garage standing up.Only issue I faced was the quick drain run time of the 5 mah battery,which forced me to stop with 3/4 of the way to recharge.I contacted customer service and they deemed battery defective,and a replacement was sent. 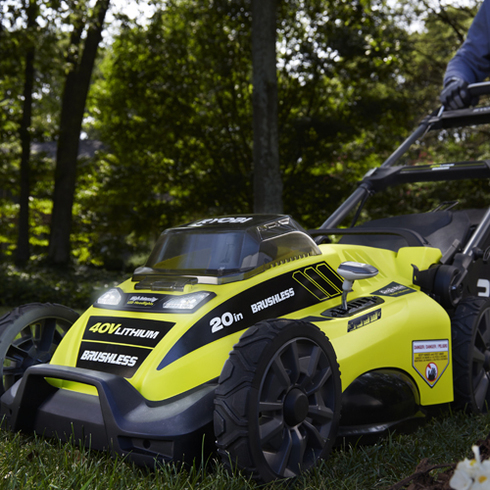 I love this mower.It does not take much space in my garage,engine is as powerful as gas without the smell and hassle of gasoline,and the 3+2 years warranty is the best. Calificado 5 de 5 por bojack de The Best Cordless Mower!! 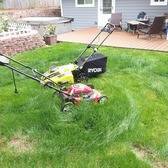 I just purchased this mower a month ago. It's my first battery operated mower and I had my concerns of performance when compared to a gas mower. I charged the battery until it was full, mowed my entire lawn at 6-8 inches high. I ran the mower for close to 40 minutes and there was still 1/4 charge showing on the meter. The power is great, no issues cutting the taller grass as the motor actually kicks in harder when it senses more resistance. Super quiet, it's not much louder than a house fan, very lightweight, quick charge, more than enough power! Very happy with this mower, Hope the quality holds up, but then it does have a 5 year warranty. Calificado 3 de 5 por James H de Shuts Off Randomly During Mowing I just bought this lawnmower, and was pleased with its performance - for about 45 minutes. Then, for what seems like no reason whatsoever, the lawnmower randomly shut off. Numerous times. It would not go more than 20 feet without stopping. I researched this issue in the manual, and the manual said to increase the height of the lawnmower. I assume this is to reduce the cutting power to the blades. That is a RIDICULOUS way to prevent it from stopping. This is the same height as my old lawnmower. If this keeps happening, I will return this lawnmower to Home Depot. Calificado 5 de 5 por btreiber de Impressed!!! I purchased this unit a couple of days ago. I read the reviews and thought I'd give it a try. I did and was totally impressed with the cutting power. I read some other reviews stating that it couldn't pick up past over clippings however mine did just fine. The only drawback that I could see was that the charge didn't last as long as I hoped. I mowed my side lawn about half my front lawn before running out of power. My total lot size is about 1/4 acre, with home, deck, and shed. However it accomplished what I needed it to. I love it and wish i didn't wait so long to purchase one. I highly recommend it to anyone wanting to get away from gas and oil. Calificado 3 de 5 por Christophe de It could be better It got the job done at least. I like the look of it, but as far as how well it works, it could be better. I had tall grass about 12 inches high. This mower kept turning itself off every chance it could get. It took me longer than i planned to mow just my front yard which isnt even that big. So i can only imagine how long itll take to do the backyard. But once i got the front yard cut, a couple weeks later it was better since the grass wasnt so high. But it still shut off every now and then. And the bag fell off a few times which was annoying as well. I just wanted to get it done but this mower increased my mowing time. 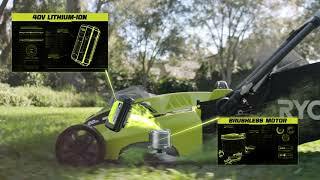 RYOBI continúa innovando y redefiniendo la cortadora de césped inalámbrica sin escobillas de 20" y batería de iones de litio de 40 voltios. Esta cortadora ofrece una potencia similar a las cortadoras de GASOLINA gracias su motor inteligente sin escobillas con sensor de carga, que le permite detectar y entregar la potencia necesaria para mantener una velocidad de corte óptima, maximizar la potencia y el tiempo de funcionamiento. Equipada con una plataforma grande de 20" y la opción de 2 en 1 para triturar o embolsar, podrá completar el trabajo rápidamente y a su manera. Esta cortadora también incluye características prácticas y fáciles de usar que la convierten en la opción perfecta para cualquier usuario. Con un arranque sencillo y un ajuste de altura de 7 posiciones, comenzará a cortar en segundos sin depender de gasolina ni aceite. Manijas telescópicas ajustables para seleccionar la altura perfecta y así maximizar el confort y reducir la fatiga. Esta cortadora trae perillas de rápida liberación y está diseñada para guardarla en forma vertical facilitando un almacenamiento compacto. Está equipada con una batería de iones de litio de 5 V y 0.40 A de alta capacidad para mayor tiempo de funcionamiento. 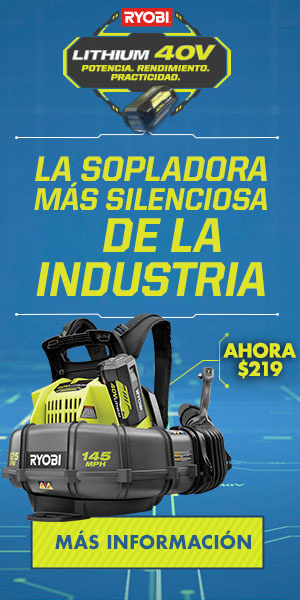 La batería y el cargador incluidos son compatibles con cualquiera de las herramientas de 40 V de RYOBI. Con el respaldo de una garantía por 5 años.